Did you know.....about the UN General Assembly? The General Assembly is the main deliberative organ of the UN and is composed of representatives of all Member States. The work of the United Nations year-round derives largely from the mandates given by the General Assembly. 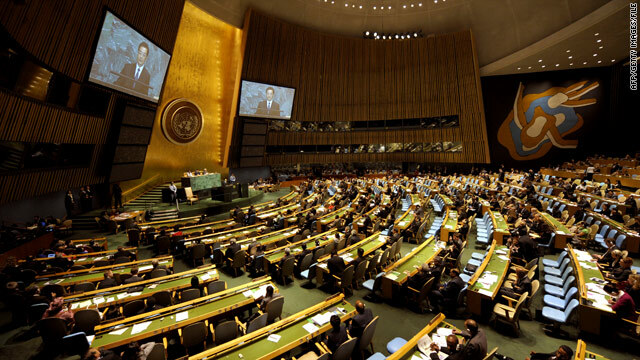 The United Nations General Assembly meets the third Tuesday of every September and is made up of 193 Member States. The newest member state is South Sudan, which was admitted as a new Member State ‎by the United Nations General Assembly on July 14, 2011. I have little faith or respect for the UN. I have it wanting almost in every case, where they needed to act, or in their actions, on the ground. It is much like the US Congress.......a lot of hot air, and no substance. Yes, and any one of the five permanent members nations have the power to veto any resolution issued. This organization is simply a cover for the elites of the world to enjoy the high life. They've been blowing smoke up people's petards for decades.